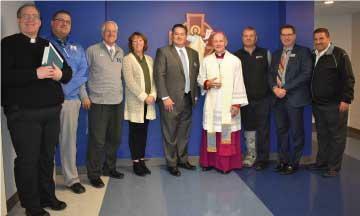 Bishop Paprocki made a special trip to visit the STEM Center after Mass on Monday to bless our new classrooms. Mr. Slaughter led a tour of the facility as the Bishop blessed each classroom as well as the teachers and students. Mrs. Sands spent a few minutes with the Bishop discussing Missions International. Mrs. Sands is a Board Member of this organization which performs missionary work in developing countries in the Caribbean, Central American, and Latin America for over 30 years.